JD Wetherspoon run 4 city centre bars in Cardiff - The Gatekeeper being one of the largest. Located on Westgate Street, just opposite the Millennium Stadium, this pub is a BIG favourite with the match day crowds. - Where else can you buy a round of 4 pints and still get change from fiver? - Where else are you guaranteed to get served instantly during any major sporting event which is screened on TV? Reason being - they don't show sporting events on TV! - Where else can you pick up 2 meals for the price of 1 at any time of the day? 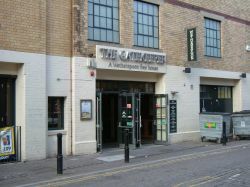 The Gatekeeper is a large cavernous pub set on two floors. There is a large bar on the ground floor and another smaller bar up top. With the daily specials on drinks and meals it tends to stay consistently busy throughout the week. Come the evening it really takes off as the pubbers and clubbers drop in for a few cheap rounds before heading off elsewhere. As mentioned above, due to the location, this pub gets hugely busy on match days as the fans soak up the pre (and post) match atmosphere with a tank full of beers.